When Oxford don Charles Lutwidge Dodgson, better known to the world as Lewis Carroll, wrote Alice's Adventures in Wonderland, he created something almost wholly unique. Part mathematical conundrum, part right of passage tale, part hallucinogenic trip but mostly a glorious ol' pile of literary nonsense, his random tale of a little girl who falls down a rabbit hole into an insane world of verbal trickery and fantastical folly has inspired the imaginations of children and adults alike for almost 150 years. 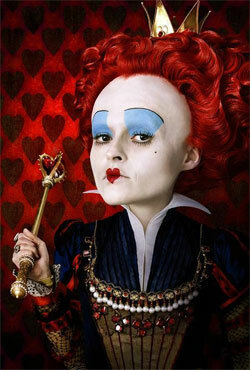 And who better to unleash their re-imagination of Carroll's story than 21st century freakshow master Mr Tim Burton? While Carroll's Alice holds the illogical adult world in utter disdain, Burton's heroine, now aged 19, is forced to enter it. And the strict rules of upper class society still makes about as much sense to her as 'jam yesterday, jam tomorrow, but never jam today'. So when, while attending a stuffy garden party, she sees a familiar-looking white rabbit in a waistcoat dash past her at top speed, she abandons her ill-favoured fiancé-to-be and follows him. Right back down the rabbit hole. And so unfolds a wonderful, enthralling and utterly charming sequence of events (I wouldn't go so far as to call it a plot), in which Alice, surrounded by a colourful cavalcade of characters voiced by a panoply of top British actors caught cooling their heels before the next Harry Potter film, must fulfil an Underland prophecy to slay the Jabberwocky on the Frabjous Day and so defeat the tyrannous Queen of Hearts. The whole film looks utterly gorgeous, combining familiar Burton gothic tropes (gnarly old trees and twisted topiary, gleaming eyes in a dark sky, weird creatures lurking at the edges of the screen) with a much sweeter, more childlike sense of fantasy and, well, genuine wonder; throwing you into an alternative universe every bit as successfully as Avatar did (although admittedly the 3D effects aren't nearly as good) and bringing Carroll's well-loved characters to glorious, Technicolor life. Because where Alice really trumps the big blue aliens is through its characters and performances. 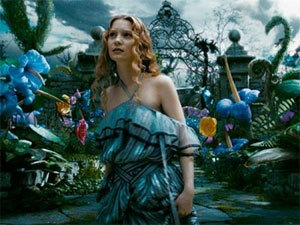 Alice herself (played by little-known Australian actress Mia Wasikowska) looks charming but is wooden as a tree. Although as she only exists to play the straight man to the comic chaos around her, who really cares? So we have Alan Rickman lending his unmistakable, supercilious tones to the blue caterpillar, resplendent on his mushroom with his hookah pipe; Stephen Fry apparating as the most appealing Cheshire Cat ever, part sinister familiar, part cuddly Garfield; Paul Whitehouse chewing the scenery Scots-style as the loopy March Hare; Timothy Spall as the most adorable onscreen dog since Up's Dug and Barbara Windsor piping up as a plucky little dormouse. Even the menacing Jabberwocky is voiced by Christopher Lee (who else?). Anne Hathaway is just a bit too hammy as the White Queen, but Helena Bonham Carter is superb as her sister and nemesis, the Queen of Hearts, giving her monstrous, Henry VIII-style character just enough humanity to make you care. But (and need I even say it?) 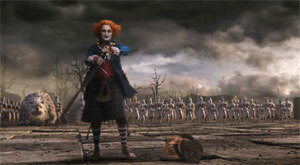 it's Johnny Depp who steals the show completely as the Mad Hatter. 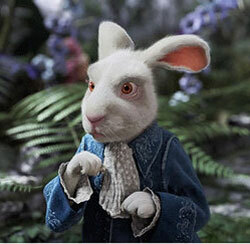 Without him, Alice in Wonderland would be a charming child's fantasy. But his manic, bi-polar performance – channelling Oscar Wilde, Joseph Merrick, William Wallace and Rab C Nesbitt in more or less equal doses – takes the film to new, darker depths that call into question the whole history and nature of 'madness', from the idiot savant and Bedlam lunatic to the medicated chemical diagnoses of the last century. If Alice's Adventures in Wonderland and its sequel, Alice Through the Looking-Glass, can be seen as distorted, crazy reflections of the truth of Victorian life, then Depp's performance perhaps shows us a warped image of our own love/hate relationship with the mad, the crazy, the slightly off kilter, our prurient fascination with lives gone off the rails. But perhaps I'm reading way too much into this (er, yes, probably – but I did once present a paper about Alice Through the Looking-Glass so you'll have to forgive me). It is, after all, a child's adventure, featuring cute canines, slobbering monsters and frog footmen. Alice in Wonderland may have received its fair share of abuse on the internet, some of it perhaps justly deserved (the script can be a bit ploddy, it's not very funny and there's no character development to speak of) but if, like me, you love Carroll's books and you love Tim Burton, it's fairly much a no brainer that you'll love this film. And however you choose to see it, adolescent allegory or bedtime storybook, psychological exploration or marvellous pile of nonsense, 2D or 3D, even, you'll find it wonderful.